Safari Magic. 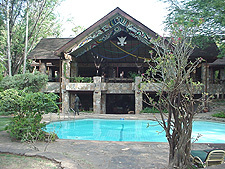 Serena Lodges and Hotels in Kenya, East Africa. 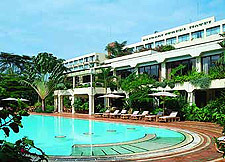 Serena Hotels are luxury resorts, safari lodges and hotels in some of the world’s most exquisite and remote settings. Each property is enhanced by its unique surroundings and expands horizons for travelers while respecting local ways of life. Indigenous design and materials are integrated with the most modern amenities and complemented by exceptional service. An eco-tourism pioneer, Serena Hotels has initiated important environmental programs to protect the Continent’s wildlife and fragile habitats. 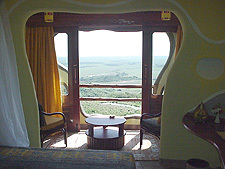 An interpretation of a traditional Masai Manyatta village of domed huts, Mara Serena Lodge is set on the saddle of a hill where it overlooks the 1,125 square miles of rolling plains, woodlands and rivers that make up the Masai Mara Triangle, one of the world’s richest wildlife sanctuaries. No other lodge has such a spectacular view of the surrounding landscape of the game and bird life that inhabit it. It is on this very terrain stretching endlessly before the lodge where the annual migrations take place, when millions of wildebeest, zebra and gazelle traverse the landscape to feed on the rich new grass and give birth to their young. The guest rooms of Mara Serena are styled and arranged to blend into the natural landscape. Every room is an individual "hut" - spread out to give each one uninterrupted views of the plains, the Mara River and the silhouetted hills beyond. 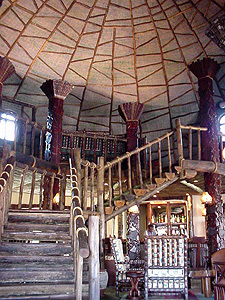 The main dining room is spectacularly decorated in three large domes and three small ones resembling enlarged Masai manyattas. Sumptuous international menus, buffets and barbecues are served to guests alongside authentic African dishes. Situated on the fertile banks of the Uaso Nyiro River in the center of the Samburu Game Reserve in Kenya’s rugged, semi-arid Northern Province, Samburu Serena Lodge echoes the robust rhythms of riverfront life. 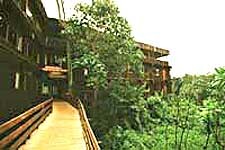 The rustic yet convivial lodge blends with the environment by making full use of native materials. The surrounding terrain is renowned for rare game – long-necked gerenuk, Grevy’s zebra, reticulated giraffe and Beisa oryx. Leopard are frequent passersby. All guest rooms have private verandas with uninterrupted vistas of the languid river and the wildlife it attracts, as well as the countless crocodiles that make the waters their home. Accommodations are cooled by breezes off the river and overhead punkah fans. 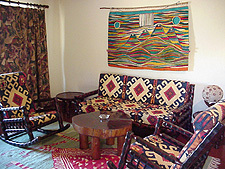 The artistic interior decor of each room is directly inspired by traditions of the Samburu tribe. On the outskirts of Nairobi’s Central Park, shaded by jacaranda, bougainvillea and acacia trees stands the Nairobi Serena Hotel. The tranquil setting belies its location…just moments from most city attractions, including art and cultural institutions, shopping, nightlife and entertainment, and convenient to nearby game reserves. A member of the Leading Hotels of the World, Nairobi Serena Hotel offers exceptional standards of accommodations, service, cuisine and amenities. Interiors inspired by Pan African design themes reach their fullest expression in the intricate timberwork that accentuates the guest rooms.Within these luxurious surroundings are found the most modern amenities. 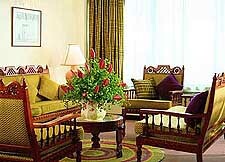 Views from the rooms are of Central Park to the east, and to the west, acacia groves and lush gardens. 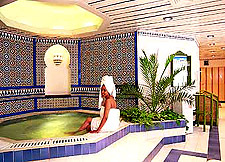 Maisha Health Club, whose name is from the Swahili word for "life" is the finest in all Kenya. Facilities include a swimming pool, sauna and steam bath, aerobics studio, fully-equipped weight and exercise rooms, juice bar and massage and beauty treatment rooms. Mountain Lodge allows the visitor an up close and personal view of the dense forest which comes alive at dusk with the sounds of animals. 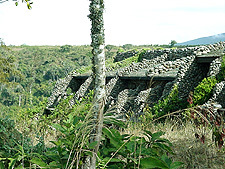 It can be reached by a good road passing through coffee, sisal and pineapple plantations. 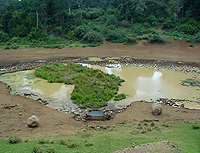 An interesting feature of the waterhole is its center island created in the shape of the African continent. Each of the Lodge's tastefully decorated and recently refurbished rooms has en suite facilities, and all have ideal view of the waterhole below. A specially constructed viewing bunker is connected to the lodge by a short tunnel and allows an incredibly close view of game as they come to drink or partake of the salty silt. Mountain Lodge is the only “tree lodge”� with direct access…no offset hotel acts as an assembly area. 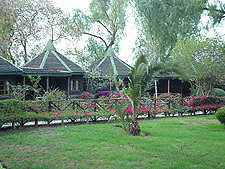 Bird watching is especially popular and the naturalist conducts daily safari walks through the forest nearby. In this other worldly setting, the drama of nature plays out daily, beneath the rocky, glacier-covered peaks of nearby Mount Kenya. Serengeti Serena Lodge is set high on a hill with breathtaking vistas of a landscape teeming with countless zebra, buffalo and gazelle…the wildlife that defines the Serengeti. Big game feed in full view of the lodge, itself. This is also the setting for the great wildebeest migrations, an awesome spectacle involving millions of these beasts. The lodge design is simple, elegant and stunning. Inspired by a traditional African village, separate rondavel "huts" house the luxury guest rooms. The uniquely crafted bedroom units maximize the use of local materials in order to blend with their surroundings. The grass capping of the roofs comes from locally occurring (but outside of the Serengeti Park) savannah grass. The buildings' stone facings utilized the stone shale that was found on the site and is common throughout the Serengeti area. From the overall impression to the smallest detail the lodge is rich in local atmosphere created by indigenous handicrafts and art.The architecture and design of Serengeti Serena Lodge makes maximum use of locally available, naturally occurring, materials and indigenous designs. Walking to the dining room and bar area of the Lodge, guests pass through open corridors with rich African carvings and high roofs. 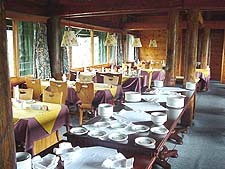 The lodge's cuisine is focused on its use of fresh food that is sumptuously prepared and cooked in front of the guests. 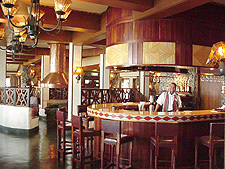 The full-service lounge and bar serves fresh fruit juices, soft drinks, tea and coffee, cocktails, wines, spirits and liqueurs. As if in a land before time Ngorongoro Serena Lodge is built into the rim of a dormant volcano, the plant and ivy-covered native stone blending masterfully with its surroundings. 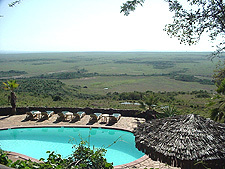 Nearby is the Olduvai Gorge with its archaeological evidence of the “birthplace of man.”� Today, the volcano and terrain are part of vast conservation lands inhabited by Masai tribes and an extraordinary variety of big game and bird life. . 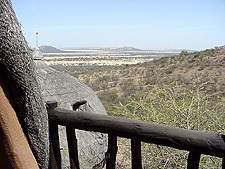 Most guest rooms have private terraces with views of the crater floor where countless animals make their home. At Ngorongoro Serena Lodge visitors coexist in perfect harmony with the natural environment and the wildlife that inhabits it. The 75 rooms are spacious with central heating, prehistoric cave paintings and balconies overlooking the Ngorongoro Crater. The furniture is created from rich hardwood timber. 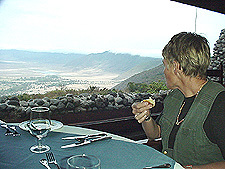 Due to the prevailing cool climate in the region, the lounge and dining room are set indoors overlooking the Ngorongoro Crater through large picture glass panels. All areas are complimented by log fires (the lodge is at 6,000 feet) which greatly enhance the atmosphere especially in the evenings. 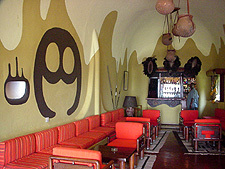 The unique design of the Lodge continues in the restaurant and bar with magnificent examples of prehistoric cave paintings found in Olduvai Gorge.